"Many insects can see and use optical polarization. For example, some insects can see the partial polarization pattern in the sky, which we cannot see without instruments. So think about scenarios in which GPS is not available, such as at the bottom of 'urban canyons.' How do you navigate?" asks Dr. Gregory. "Some insects, including bees, ants and locusts, navigate by sensing the celestial polarization pattern, and it would be pretty cool to understand how they do that and exploit the mechanism to deal with GPS-denied situations." "We want the insect to think it's outside," Dr. Gregory says. "What we're developing is an IMAX-like screen for insects," Walker says. "What I do is test candidate materials for the screen." The fact that insects can see in a wider spectrum than humans adds to the challenge. "It's got to be ultraviolet through human range visible, and I know the UV range is a tough nut to crack." In the lab, Walker uses a monochromator to select wavelengths of light he concentrates on a swatch of prospective screen material, and then measures the amount of light reflected or transmitted across a 180-degree arc, all while monitoring the reproduction's faithfulness to the wavelengths and polarization being input. His work is augmented by research into polarization by scattering done by team member Ahmed Elsehly, an optical science and engineering doctoral student who also serves a primary role as the researchers' expert on the Zemax optical design software they use. "Zemax is the industry standard for optical software, and I would say there's no one at the university who understands it better than Ahmed," Dr. Gregory says. 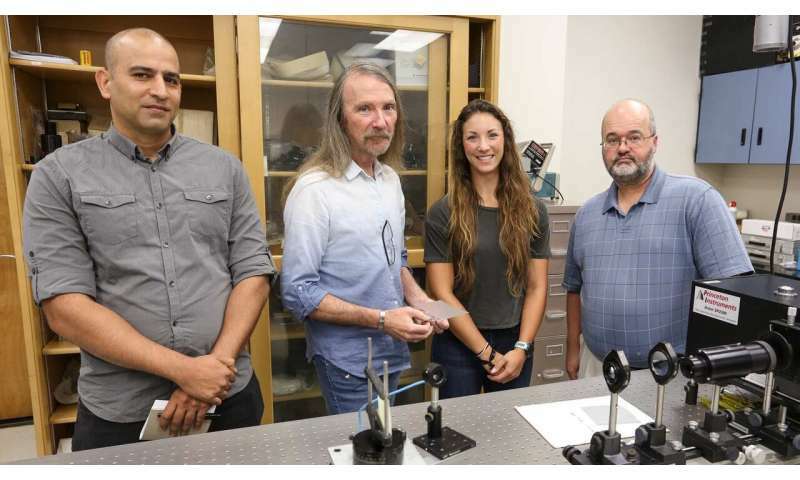 The second hurdle to insect virtual reality is the screen refresh rate, which is being tackled by Samantha Gregory, Dr. Gregory's daughter and a graduate student in physics. "Half the challenge of getting them to believe what the screen is showing them is real is getting the screen to flicker faster than the insect can detect it," she says. That's quite a feat, since the rate at which the insect sees separate refreshes as a continuous image in motion, which can be as high as 400 Hz, is well above the display rate of about 60 Hz where humans see moving things on a screen as continuous motion.